The following article is an excerpt of Thomas M. Brophy's AZBEX Private Development Summit presentation delivered on May 8, 2018. (1) Although their finances are better, renters are comfortable with continuing to rent with many believing renting will be more affordable or stay the same for them in the next 12 months: This quarter saw an increase in the number of renters saying they want to stay in place because they like where they live, even though their rent has increased. (2) More renters say renting is a good choice for them now and have no interest in ever owning: The expectation to purchase a home is lower than it's ever been (41%), and more Baby Boomers now say they have no interest in owning. (3) Millennials are staying put, choosing to continue renting over owning: While home ownership is on the horizon for some, fewer younger renters say they are working towards it. 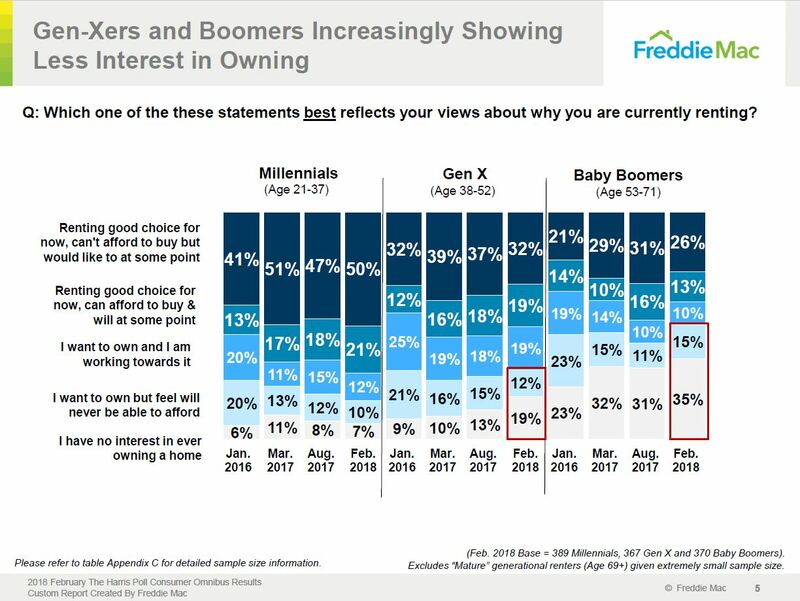 Digging further into FreddieMac's research, the first chart shows that across the board, whether Millennial, Gen X'er or Baby Boomer, the increase in those who have no interest in owning has increased, most significantly for Baby Boomers with a 12% increase since 2016 and Gen X'ers with a 10% increase. 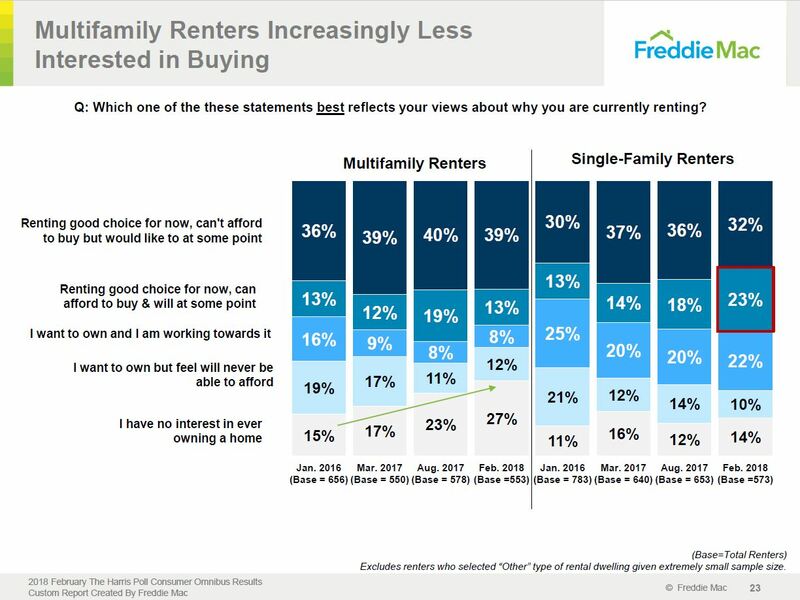 Also, as the next chart shows, even multifamily renters are less interested in owning a home now than in 2016 increasing 12%. Nonetheless, and an area SFR REIT's and the like should track, current single family home renters that can afford to buy and will at some point is on the rise. Lastly, and I'll be discussing this a bit later but keep this question in the back of your mind, with the rise of the single family residential REIT and private investor acquisition of single family homes for rent, has further displaced a lot of renters who otherwise would have purchased but are effectively priced out. Given these changes, is the traditional single-family home a relic of the past? As can be referenced on the chart, separated by project delivery date, despite continued increases in available inventory, new units have been swiftly absorbed with most new build projects at or near 94.5%. If you look at the areas circled would suggest that as new projects are delivered a portion of residents move to the newer projects. Despite this movement, all projects have been stabilizing higher within 6 to 9 months. As we dig more into the development type numbers, Midrise developments have experienced higher occupancy rates than their garden variety counterparts. In fact, they've been averaging 1% higher occupancy rates since 2011. (1) Since Phoenix has never really had a sizeable midrise inventory before, people tend to gravitate toward the unique. Hell, even I've been surprised at the rate of Midrise, more urban living adoption by Phoenicians. (2) Another reason for higher mid-to-highrise occupancy; both Garden and Neo-Garden type product tend to be more on the periphery of the MSA, as such they compete with more single-family home rentals. Looking at the institutional single family home rental chart, almost 13,500 homes are owned and managed by various SRF REITs, like Blackstone founded-Invitation Homes, American Homes 4 Rent, Silver Bay Realty Trust (purchased by Tricon Capital in 2017), and professional investment companies-like Cerberus, who's been in the news lately for purchasing 300+ homes to be operated as rentals. 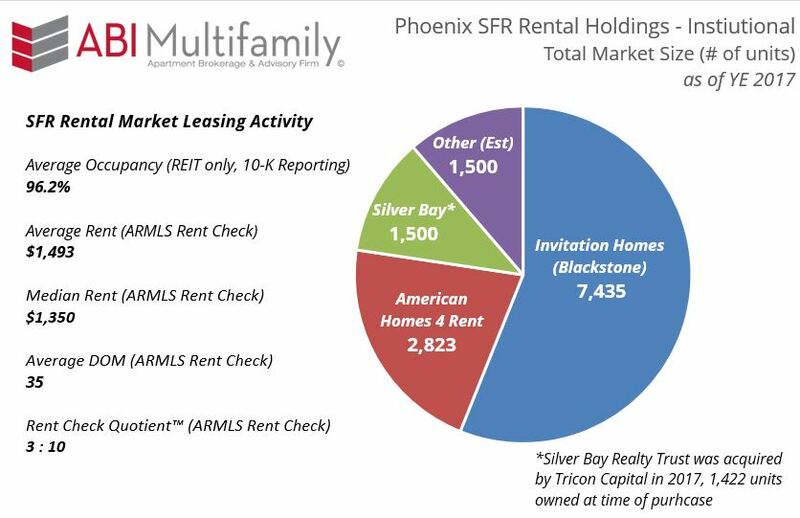 A few interesting tidbits I was able to glean about the scope of the single-family REIT market from their 10-K filings; average occupancy across all SFR REIT's operating in the Phoenix areas was 96.2% which is a about 1.2% higher than the multifamily average. According ARMLS Rent Check average rent was $1,493, almost $500 more than the average multifamily rent but only $20 higher than average rent for newly built garden communities. Neo-Garden communities, like the ones developed by NexMetro (Avilla brand), Christopher Todd Communities, BB Living Residential, are more closely related to single-family home and/or duplex style development. They typically are one story in height, have closed backyards and are located in the outer areas of the MSA near major transportation arterials. They are a relatively new entrant into the multifamily space and closer in relation to the overall institutional single-family home rental market. 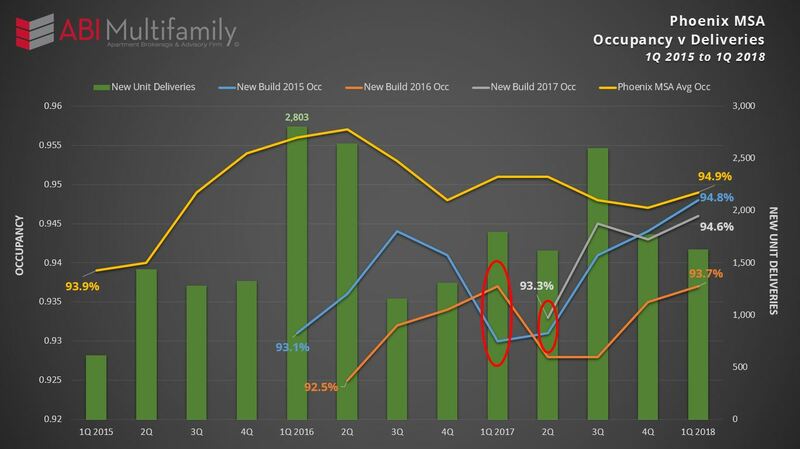 At the end of 1Q 2018, there were 6 Neo-Garden communities with a total of 910 units under construction. 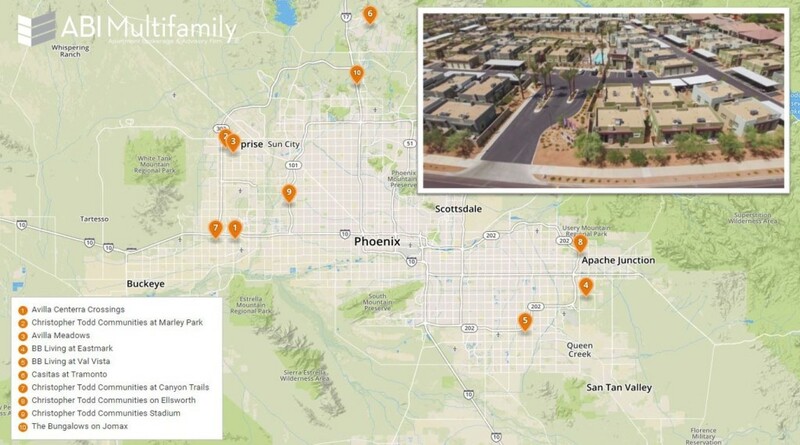 As the map shows planned Neo-Garden communities are set for a substantial increase with 1,994 units, across 10 communities at various points in the planning process. According to GMO, a private investment management firm with over $70B AUM (Assets Under Management), forward looking equity asset return estimates are all well below their historic 6.5% return mark, which has investors on the hunt for yield and, more importantly, stability. 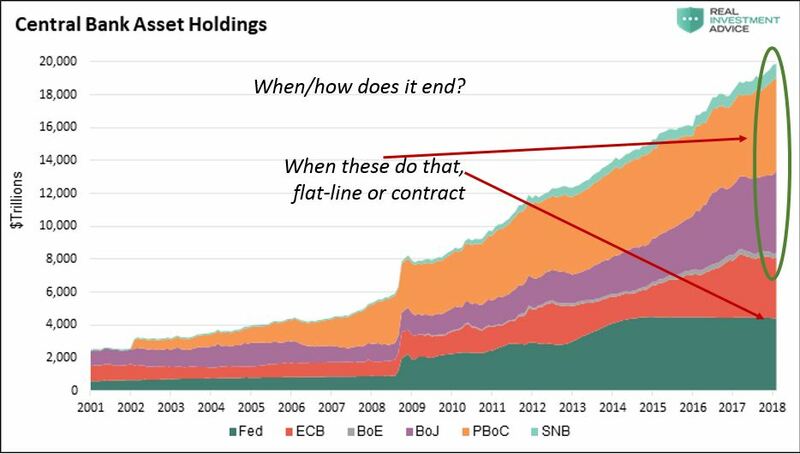 Stability, in today's world, is preservation of capital and cash flow. Multifamily has been, and continues to be seen as providing that stability, particularly in the growing regions of the West and Southeast U.S.